Low-fat biscuit dough can be used to make a hand-held sandwich. 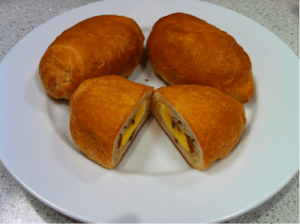 Filled with potatoes, egg, bacon and cheese, it’s a great grab-and-go breakfast or snack. Refresh Hashbrowns according to package directions. Roll or pat each biscuit dough into a 5-inch circle. Place 2 tablespoons hashbrowns mixture, half of one hardboiled egg, and 1 tablespoon bacon on one side of the dough circle. Sprinkle with parsley.